This topic describes how to migrate your instance within Alibaba Cloud ECS. 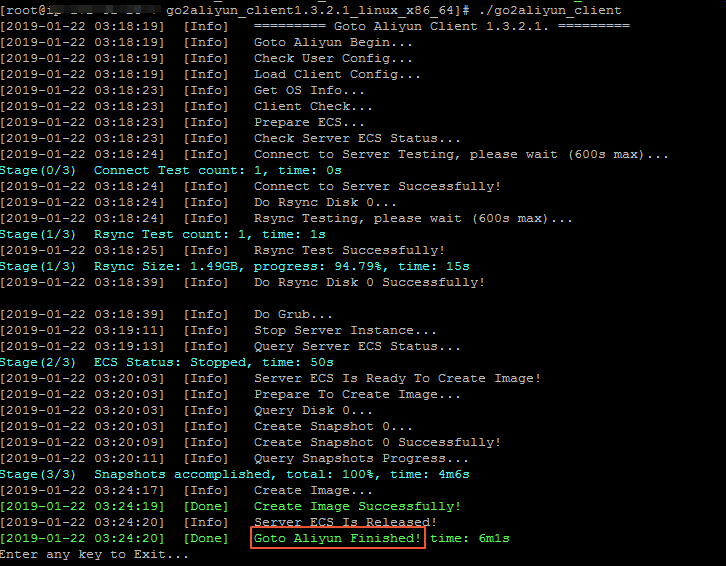 If you want to migrate your ECS instance within Alibaba Cloud ECS, we recommend that you Copy images and Share images. If these two methods do not apply, you can use the following procedures as needed. This method applies to scenarios where you need to shrink your ECS disk volume. For more information, see Shrink disk volume. In these scenarios, we recommend that you migrate your instance through VPC to maximize transfer efficiency. For more information, see VPC-based migration. This method applies to scenarios where you need to migrate your ECS Windows instance between different accounts, regions, or VPCs. Create a snapshot to back up your data. Check the validity of your application licenses. Note After your ECS instance is migrated between different Alibaba Cloud VPCs, the underlying hardware devices of the system will change, which may result in the associated application licenses becoming invalid. If your network uses international regions, the migration may be slow due to unstable network connections. If your network can connect to VPC, see VPC-based migration. Verify that the Windows VSS service is enabled. Check whether you have installed the qemu-agent tool. If so, uninstall it. For more information, see Cloud Migration tool FAQ. We recommend that you use a test machine to conduct migration tests before completing the actual procedure to ensure the migration is successful. Download and install the Cloud Migration tool onto the server to be migrated. For the configuration methods of these items, see Configure the user_config.json file. (Optional) Configure the directories or files that do not need to be migrated. For more information, see Exclude files or directories from migration. Run the main program of the Cloud Migration tool. Run go2aliyun_client.exe or go2aliyun_gui.exe as the administrator. If the main program is a GUI version, click the Start button to start the migration. This method applies to scenarios where you need to migrate your ECS Linux instance between different accounts, regions, or VPCs. Go to the directory where the Cloud Migration tool is located. Run the ./Check/client_check --check command to check whether the EC2 instance to be migrated meets the migration conditions. Note If all check items are OK, you can start the migration. Otherwise, you need to check the GRUB bootloader and Upgrade GRUB to 1.99 or a later version (applicable to systems with earlier kernels (such as CentOS 5, Red Hat 5, and Debian 7)) as the root user. Run the following command as the root user to grant the execution permission to the main program, and then run this program. Wait until the main program of the Cloud Migration tool has been completely executed. When the message Go to Aliyun Finished! is displayed, the migration is successfully completed.